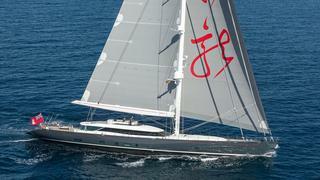 The 51.7 metre sailing yacht Red Dragon, listed for sale by Jonathan Barbe at Edmiston & Company, is now sold in a direct deal. Designed by Dubois Naval Architects, Red Dragon was built by New Zealand yard Alloy Yachts and launched in 2008 as an aluminium fast cruising sloop. She has a magnificent contemporary interior by Wilmotte & Associates with accommodation for up to nine guests in four guest cabins and a gym. The master suite is full beam and there are two identical doubles and a twin cabin with a Pullman berth. All have individual climate controls, television screens, en suite facilities and access to a Kaleidescape server for on-demand movies and music. In addition, the fully equipped gymnasium has a Pullman berth for one guest. The aft deck is large and offers the perfect spot for cocktails at sunset while her cockpit houses an enticing area with al fresco dining and relaxation space for up to 10 guests. Her flybridge has a bar with an expansive sunbathing area and a retractable Bimini top. Sloop rigged, Red Dragon was offered for sale with a full set of Doyle ‘Ice’ sails, a Marten Spars 62.5 metre High Modulus carbon fibre main mast, along with a carbon fibre rig and boom, again by High Modulus. Winches were all custom made by Alloy Yachts while standing rigging is by Future Fibres and Nitronic. Under power, a 1,400hp Caterpillar engine gives her a range of 4,900 nautical miles. Lloyds classed and MCA compliant, Red Dragon was asking €17,950,000.